To place orders, just call 010-5137400. The kind lady on the other end is Tini. The creator of what would be the latest food craze to hit KK. Remember, you heard it first from us at everydayfoodilove. Passion and perseverance is all you need to make good food, it also helps to have an army of critique at home to fine tune that secret recipe. And this is just what an budding self made pastry chef did to make a mildly successful home operation. Available in various fruits (depending on seasonal availability), mixed in freshly whipped cream wrapped around a thin crepe. We had the opportunity to try out their top sellers: Durian, Mango, Yam and Oreo Crepes. The durian crepe was rich in aroma, sweet mashed in rich thick cream. The crust, although thin, was firm enough to hold the innards in place. The mango crepe was also just as awesome, the tangy mango flavour was even out by the rich cream that results in a harmoniously balanced taste. As you bite down, you are first greeted by a firm crepe, then followed by soft and rich cream and finally the sweet mango. The yam was also just a good, with a nice earthy twist amidst the familiar creamy surrounding. 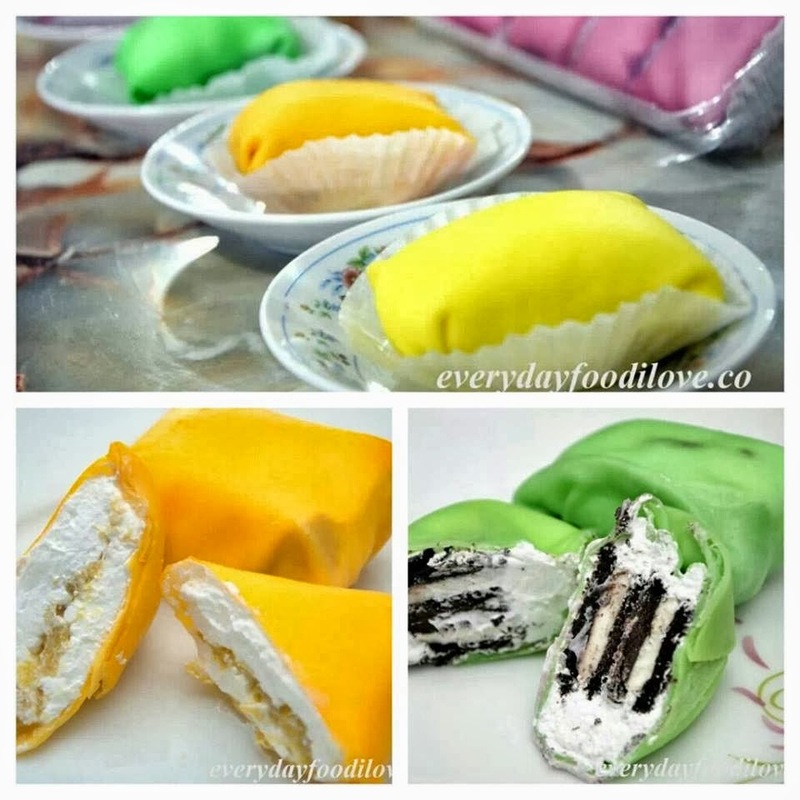 What's really impressive is that the rich and thick filling gives these colourful bite sized goodness a sheer mass. Yet the firm crust hold everything in place, making sure everything is symmetrical. Also, you can order the yam cream cake. These creamy layered bad boys is topped with a generous layer of shaved cheddar. So the creamy sweet and earthy sandwich is intertwined with savoury twist. The 'cakey' portion of this pastry ensures proper mass for the nice bite effect. To avoid disappointment, call ahead to make that massive order that we know you want. How much of each crepe? The number i call but didn't answer..i sms didn't reply..